Ref: (i) Hon’ble MR’s D.O. No. 2012/F(E)III/I/4-Pt dated 29th March 2014 to Hon’ble Finance Minister, Government of India. (ii) Hon’ble MR’s DC. No. 2012/F(E)III/1/I/4-Pt dated 20th Nov 2015 to the Hon’ble Finance Minister Shri Arun Jaitley. (iii) NFIR’s letter No. IV/NPS/PFRDA BILL/Part I dated 13th Feb, 2017, 26th Oct, 2017 and 11/12/2017. (iv) Railway Board’s letter No. 2012/F(E)/III/1(I)/4-Pt dated 13/02/2018 to GS/NFIR. Kind attention is invited to the correspondence cited under reference, latest being Railway Board’s reply received vide letter dated 13/02/2018 wherein the Federation has been conveyed that the Hon’ble Minister of Finance and Corporate Affairs has communicated that the matter was re-considered in consultation with Pension Fund Regulatory and Development Authority (PFRDA) and the request for exempting Railway employees appointed on or after 01/01/2004 from the application of NPS does not seem to be a feasible proposition. While NFIR does not agree with the reply of Hon’ble Finance Minister, the Federation re-iterates the valid points placed below, urging upon the Railway Ministry to impress upon the Government, the need for exempting Railways from “National Pension System (NPS). The Finance Ministry has also failed to evaluate that it is the Indian Railways which works as supply line to the Armed Forces during crisis periods by transporting troops from one comer to the other including the nation’s borders besides transporting Military hardware and other war material. In no way the performance of Railway employees can be underestimated than that of the Defence Forces Personnel. Like Armed Forces, many of the Railway Personnel do stay away from their families for longer durations in, the course of performing duties at remote places where minimum basic amenities like suitable accommodation, schooling, drinking water, health care facilities have been missing. Comparing the structure and importance of Railways with that of the Army, it would not be out of place to state that just as the “Army requires a critical mass to fight battle/war, in similar way critical mass of trained employees is required to maintain Railway Tracks, Rolling Stock and ensure operation of services”. On an average over 700 Railway employees die per annum while performing their duties and nearly 3000 employees sustain injuries as reported by High Level Safety Review Committee (HLSRC) headed by Shri Anil Kakodkar. The sacrifices of Railway employees are unparallel. Considering the strong merits in the demand of the Federation, Hon’ble MRS have written to the Minister of Finance to have a re-look into the case to be considered favourably to exempt Railways from the ambit of National Pension System (N PS). Federation desires to mention that the Finance Ministry has erred and equally not considered the justified demand of the Railway employees projected by NFIR, perhaps applying different logic and ignoring the facts mentioned above. In this connection, NFIR reminds that the Federation leaders in the meeting held on 09th February, 2018 at Rail Bhavan, New Delhi had specifically requested the Hon’ble MR to kindly reach the Hon’ble Prime Minister for getting Railways exempted from the application of National Pension System (NPS). 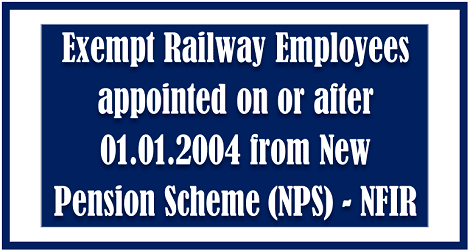 It is a known fact that the NPS has generated lot of anger and anguish among the younger generation of Railway employees appointed on or after 01/01/2004 due to the inherent disadvantages of the NPS which does not guarantee even minimum pension i.e. half of the last pay drawn by the Railway employees. NFIR, therefore, once again urges upon the Hon’ble MR to kindly take steps for reaching the Hon’ble Prime Minister for getting exemption of Railways from NPS at an early date.